The domestic Silmusalaatti salads are always fresh and tasty. Try them and find your favourite! The pure and domestic Silmusalaatti has many versatile uses for cooking. Your imagination is the only limit! Silmusalaatti is always fresh and grown safely from pure ingredients only. Silmusalaatti is tasty and provides several different flavours and textures – a great option for the person looking for variety on their plate. Silmusalaatti is on sale at every well-stocked store’s vegetable section! Silmusalaatti is suited to many different kinds of cooking uses. You can enjoy it in the raw or in salads, in sandwiches or woks, as garnish for pasta dishes, on top of soups, as accompaniment to fish, chicken, or meat…there are many different ways! 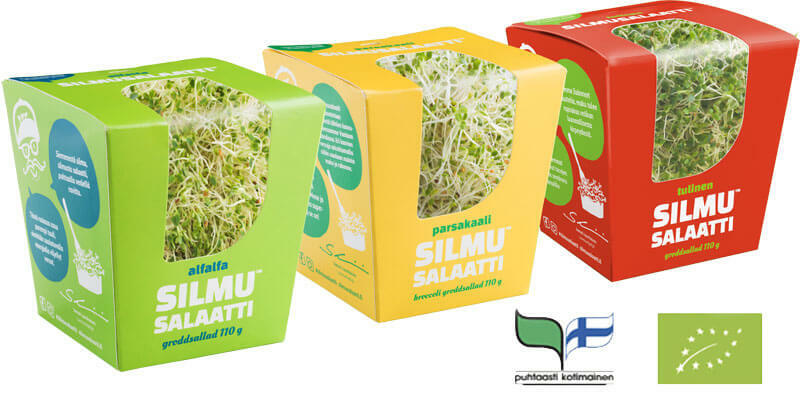 The Silmusalaatti salads are cultivated in Vaarala, Vantaa at the homestead of organic farmer Samuli Laurikainen. We harvest our greenhouse close to a hundred times a year to be able to offer You the best possible taste. The clear water of Lake Päijänne and clean seeds are all that we need for cultivation. The taste of each Silmusalaatti variety comes from the precise use of varieties, with nothing extra added.